Getting your hands on a free copy of your credit report and checking it for errors is one of the easiest ways to help your financial health. Correcting even a small mistake can make a huge difference to your score. A higher score means lower interest rates, insurance quotes, and can even help you land some types of jobs. And it's never been easier to get a copy of your free credit report. 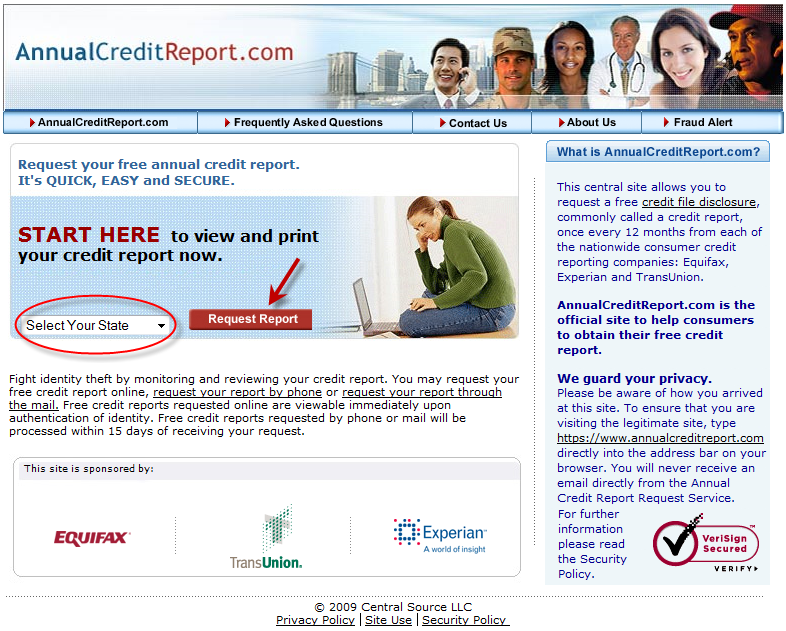 AnnualCreditReport.com is a government-approved site that enables most people to gain access to their reports within minutes. Under law, you have the right to obtain a free credit report from each of the three major credit bureaus once every twelve months. Courtney and I stagger our requests so that we are able to access a different bureau every four months. Warning: There are many scam sites that try to rip-off AnnualCreditReport.com. Stay away from the cheesy commercials and catchy jingles. AnnualCreditReport.com is safe, approved, and regulated. I'd like to know how to get a free copy of my credit report from the agencies. A recent federal law gives consumers access to their credit reports; however, it costs extra to obtain your credit score. Your credit score is not an actual component of your credit report. Order it online at AnnualCreditReport.com. You will need to provide some basic information, including your social security number, and you may need to provide some personal financial information. If you plan to check your report online, be wary of impostor sites. Be absolutely certain that you have reached AnnualCreditReport.com. It's important to obtain a copy of your credit report at regular intervals. The credit reporting agencies are not infallible, and neither are your creditors. People make mistakes, and mistakes on your credit report can cost you money. If you suspect an error, read how to dispute credit report errors. When you request your free credit report, you'll also be given a chance to purchase your credit score for about $8. Your credit score is a single number that serves as a snapshot for your overall creditworthiness, a sort of summary of your entire credit report. To learn how your credit score is computed, read my anatomy of a credit score. On the homepage, all you need to do is select your state from the dropdown list and press the red “Request Report” button. Next, enter the required information (marked with a red *). 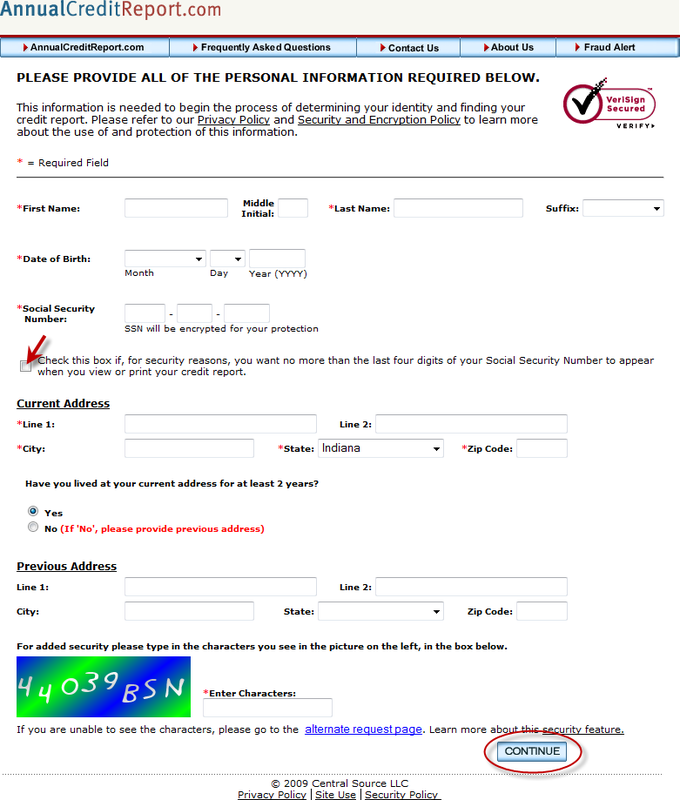 I recommend checking the box (I've highlighted with the red arrow) to hide your social security number should you print out the report. Enter in the security code and select “Continue”. 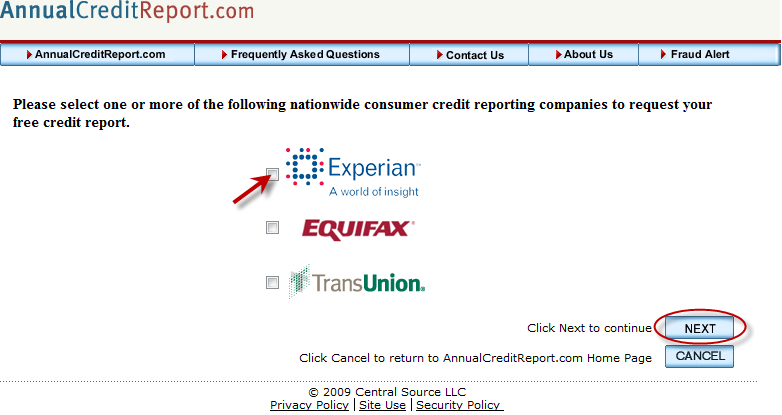 On this page you can select the bureau (or bureaus) you'd like to get your credit report from. Courtney and I stagger our request and only pull one every four months. This screen is just a confirmation that you'll be visiting the specific site of the bureau you selected. You are now asked to verify your identity on the specific site of the bureau. 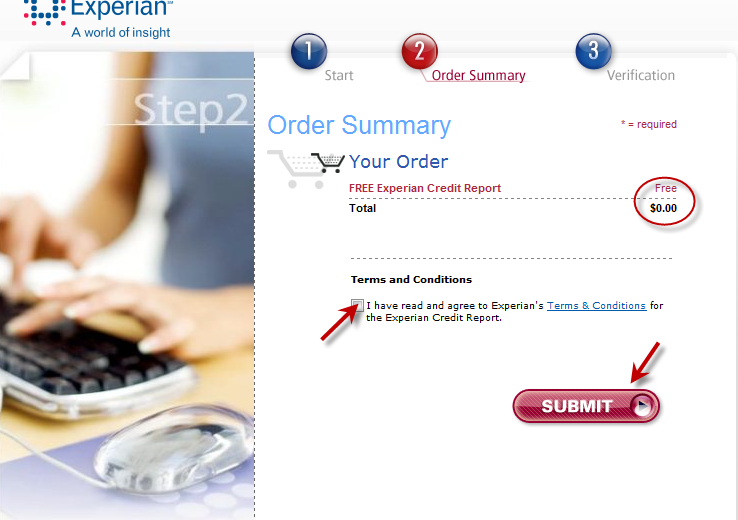 This is Experian, although TransUnion and Equifax have similar confirmation screens. Enter your information and press the red “SUBMIT”. Experian would now like to make a quick buck. 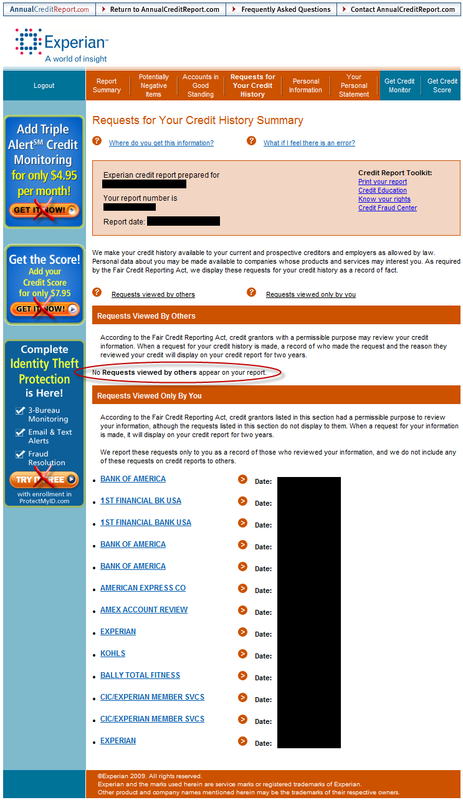 Avoid the upsell, and click “Annual Credit Report” highlighted below. Next is the Order Summary screen. Verify the amount is $0.00 (Free). Click the red “SUBMIT” button. Lastly, you have one more confirmation screen before gaining access to the report. 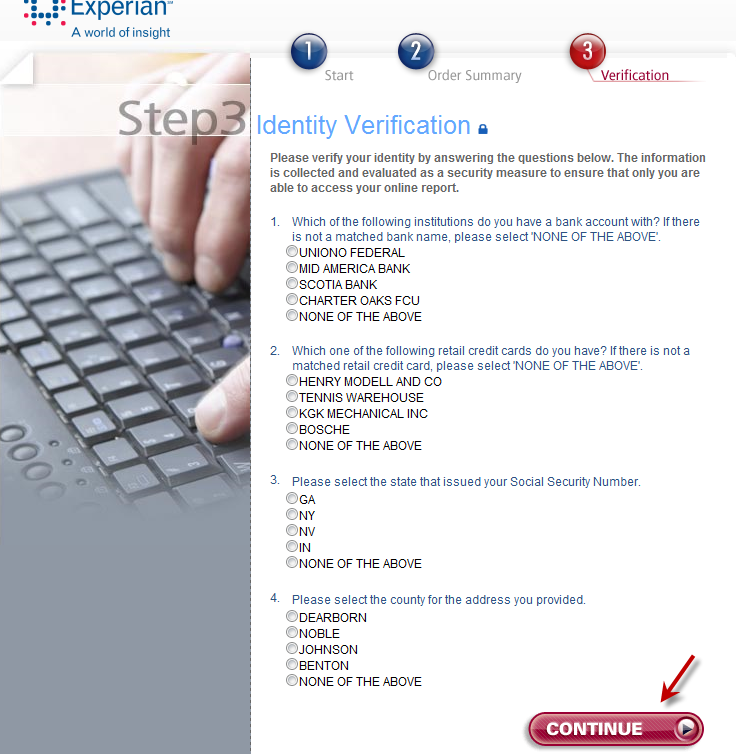 Experian asks you four security questions regarding information on the file. Answer the questions (some may very well be “NONE OF THE ABOVE”). Now you have access to your credit report! Look over the Summary, Negative Items, Accounts in Good Standing, Requests, Personal Information, and Personal Statement tabs at the top. Notice the “print your report” link I've highlighted in case you want to retain a copy. As always, avoid the upsells to keep your access free! Here is a real-life example of what identity theft looks like! There's one negative item listed as “charged off”, but that was a fraudulent account. This is now the third time it's appeared on Courtney's report after being removed. Negative items feature a “Dispute this item” button that walks you through the dispute process. This is an example of the “Requests for your credit history” tab. You can see there are two primary categories: one for “Requests viewed by others” (hard pulls) and one for “Requests viewed only by you” (soft pulls). In this example, a third party would not see any recent requests for use of credit, since there are none listed for that category. Mark Frauenfelder (founder of the awesome Boing Boing) has a piece at PC.com that asks: When is a free credit report not a free credit report? The answer, of course, is: When it comes from FreeCreditReport.com. I got my credit report, looked it over, and forgot about it. A week later I was looking at my checking account register online and I noticed a $14.95 charge from a company called CIC*Triple Advantage. I didn't recall buying anything from a company with that name, so I entered “CIC*Triple Advantage” into Google. The search results made my eyes bug out of my head. This was the name of the billing entity for freecreditreport.com. The thousands of search results were full of words like “deceptive practices,” “scam,” “ripoff,” “unauthorized billing!” and “beware!” In fact, all the top results were either from people complaining that they'd been conned into signing up for a $14.95 monthly credit monitoring service without their permission, or they were about how to cancel the service. Frauenfelder admits that it's his fault for being duped, but still thinks FreeCreditReport.com is slimy. Read the rest of his story for other problems he has with the service. Finally, on a lighter note, a post in the GRS forums pointed to this spoof commercial highlighting the problems with FreeCreditReport.com. You can request a new report card every thirty days. It draws its data from the TransUnion credit bureau. Its data comes via a “soft pull” of your credit, so using it will not affect your credit score. Curious, I signed up for Credit Report Card myself. Some GRS readers will be wary because the sign-up process requires that you submit your Social Security Number (which is needed to pull your credit report) and asks a couple of broad but personal questions. I felt comfortable with this, though, and created an account. Each section of the Credit Report Card also contains a detailed explanation of how your grade was derived. These sections contain a couple of paragraphs each explaining how credit scores work and recommending actions you can take to improve your credit. The Credit Report Card isn't earth-shattering. It's not a tool that's going to revolutionize the way you deal with money. It is, however, a useful way to monitor your progress. I've added the site to my bookmarks, and I plan to check in every month or two when I'm doing my personal finances. So what are you waiting for? If you've put this off in the past, schedule a time to get your free copy and review it for errors! Your credit score and your wallet will thank you. There are 174 reader responses to "How to Get Your Free Credit Report Online: A Step-by-Step Guide". I pay a small fee for quarterly updates at mycreditinform.com. Their credit calulators (“What would happen to my score if I…”) are great as well. I recently tried to apply for a o% interest credit card for my business so that I could balance transfer to it an amount from another card that had been at 0%. But the card company told me they couldn’t allow it since the folks at Equifax said I had insufficient credit history. So I called, well I tried calling, the Equifax people to see what was going on since I have had all sorts of credit cards and loans and financial interactions over the years and I presently have two company credit cards. I got an automated system. But I persevered and finally got the real number of a real person. However, when I requested my free credit report he began to ask me to tell him what my current credit cards and their numbers were. This was after varifying my SS# and my Dr. Li. #. I balked at his question since i thought his agency is supposed know this stuff already. I couldn’t figure out why I had to tell him what he should already know. So I tried another number he gave me, and they sent me a form letter to complete my request. I read your blog frequently. I was very happy to link to it! I recently saw this website – http://www.freebiecreditreport.com – claiming that you can get a credit report and credit score 100% free. Ha! Yeah as long as you remember to cancel the 7 day trial. Consumer beware, sign up for these services if you must, but remember to cancel before trial ends or be billed up to $30/month. Yeah well needless to say I neglected to cancel within the free trial and had to shell out the dough. With commercials like the ones they’re running, I’m surprised anyone takes them seriously. Pirates and “ye olde fair” commercials are funny and all, but not when those people are asking me for sensitive information. Although the guy that sings in them is getting some good play from them, and I’m all for that. Not sure if you found this in your research, but here’s the real kicker of the whole deal: FreeCreditReport.com is owned by Experian. It’s sickening. You would think a company selling $15/month subscriptions wouldn’t be able to afford millions of dollars of radio and TV advertising, and you’re right. It’s backed by Experian. Makes me sick. I’m thinking about taking the next step–freezing my credit. We have our fixed rate mortgage at 5.5%. We have our one credit card that we pay off every month and earns 1% cash back. Good and growing savings, no car loans now or in the future. In short, no need for debt other than the mortgage, which we’re paying aggressively. Freezing credit would primarily be as a protection against identity theft, but as a loyal reader to this site, I admit that I kind of like its other implications. I used FreeCreditReport.com over a year ago. At the time they didn’t have the $14.95/month thing as clearly marked as they do now. It took me forever to figure out who CIC*Triple Advantage was. When I finally did I went to their website and found the cancellation phone number. Cancelling wasn’t too hard, except for the guy trying to sell me more trial offers. If you stick to your guns they will cancel and stop charging you. I don’t like FreeCreditReport.com at all. Other credit monitoring services in the same ilk have a similar policy of challenging anything negative that comes across — even if it is accurate. And sometimes there is a fee for that as well. Honestly, after I’ve used my free reports from annualcreditreport.com, I’d rather just go to one of the bureaus and pay the fee. Unfortunately, annualcreditreport.com is useless for people like me- Americans who live or are stationed overseas. The site is only accessible from within the US. I was burned by these guys too. Ugh. I’ve used for annualcreditreport.com every year for a few years now and appreciate being able to get the reports for free, but the government went half-assed on this – they should have required them to give us the credit score too, as the credit score is what really matters. When you order your free report here, you will begin your free trial membership in Triple AdvantageSM Credit Monitoring. If you don’t cancel your membership within the 7-day trial periodâ€ , you will be billed $14.95 for each month that you continue your membership. I’m not sure how people unknowingly get roped into this. The front page of the site says “When you order your free report here, you will begin your free trial membership in Triple Advantage Credit Monitoring. If you don’t cancel your membership within the 7-day trial period, you will be billed $14.95 for each month that you continue your membership.” The commercials say “Offer applies with enrollment in Trip Advantage.” So it seems that people are upset because instead of paying attention to what they were signing up for, they just listened to the guy in the pirate hat sing his funny song. Again, our government is a bunch of pansies not to have hammered these idiots about this issue. I think the do nothing regulators need to make freecreditreport say “YOU ARE BUYING A MEMBERSHIP FOR $X” or “YOU WILL PURCHASE A MEMBERSHIP FOR $X”. That is if the government couldn’t just take over the domain itself… eminant domain indeed. Helpful hint about credit reports. If you are the victim of ID theft, and you put a fraud alert on your credit report, all three credit reporting agencies are required by Federal law to send you a copy of your report. You can renew the alert every 90 days, and they must send you the report. This is in addition to the free report you’re entitled to once per year from each agency. Just last week I helped my father who wanted to get his Credit Score through this site (the Free Credit Report, blah, blah, blah). We did submit his credit card info and, as they state, he was signed up for the “Triple Advantage” offer. After digging all over the site– we DID find the phone number to call if you want to cancel (not an easy thing to find but it is there). We called immediately, got a representative who attempted to keep my dad locked in, but after several refusals, we were able to get it cancelled. He is going to keep an eye on his upcoming credit card statement just to make sure that they really did cancel it. If overseas, you should be able to get your credit report by mailing in a paper request form. Click the link in the article for “Annual Credit Report Request Form,” and follow the links to print off the form and mail it in. I was taken by the FreeCreditReport “scam” as well. Do yourself a favor and stay away from these guys. In contrast AnnualCreditReport.com has been a joy to use. It is a very useful thing to have such a service provided you for free. 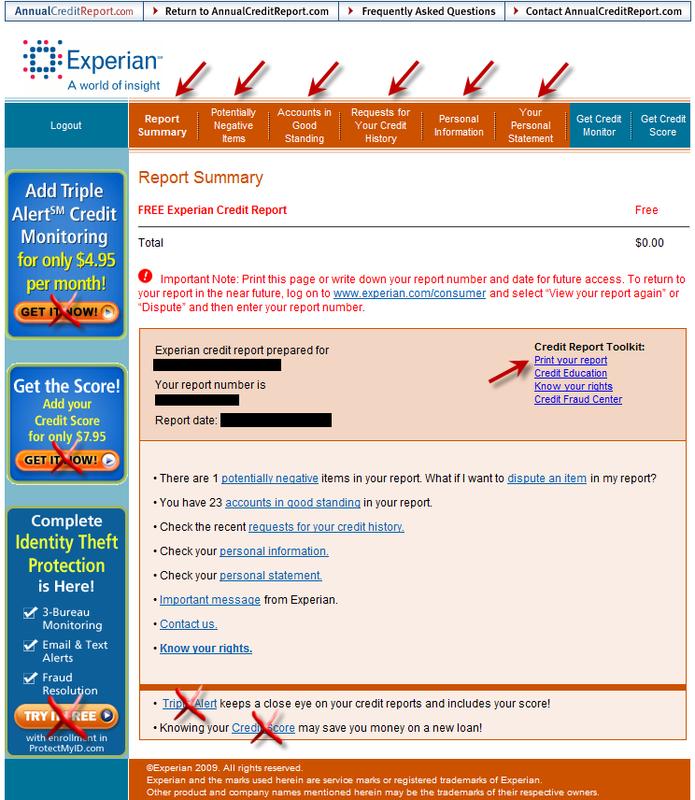 As you mentioned in your article, I prefer to spread my credit reports out 1 every 4 months. Regarding credit score…people should be aware of the fact that Experian will consistently have the lowest credit score of the other 2 reporting companies. This is not a theory, but a reality that I have been witness to over the last few years since securing my free annual credit reports in this manner. Thank you for raising awareness on this topic! Oh, don’t stop there! I read the fine print and after obtaining the report, I immediately called them to cancel my subscription, and I’ve NEVER experienced such aggressive customer service. They started castigating me for not caring about my credit. I actually laughed briefly at the ludicrousness of their pitch, and they said (real quote), “What, sir, do you think this is a laughing matter? Do you think identity theft is a laughing matter?” This went on for a few more seconds, then I told them THEY were a laughing matter, then I told them a few things that I can’t print here. I think the people noting the disclaimers are missing the point. Or points. 1. There’s already an official way to get free credit reports that offers no risk of being charged. 2. The disclaimers are apparently rather new. 3. Regardless of the disclaimers, this is a company that bills itself as offering “free credit reports”, but that’s not its actual business model. Its business model is to sell people a subscription service credit-monitoring tool. If they called themselves something like “Expert Credit Monitoring”, but offered free credit reports as a premium for signing up, nobody would have a complaint. 5. The FreeCreditReport.com ploy works well enough, regardless of the disclaimers. Many people, and many smart people (Mark Frauenfelder is not stupid) get trapped into the monthly payments. 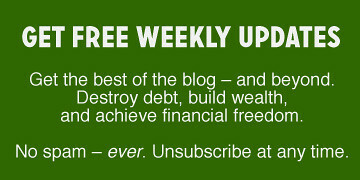 Obviously, FreeCreditReport.com isn’t the first one to think of this business model. Many companies offer something for free, and then have fine print saying that by agreeing to the free thing, you’re enrolling yourself in an expensive monthly thing. For example, when we moved into this house, I got an offer by mail for some free service or other. I signed up. But then I noticed in my introductory package that I had agreed to subscribe to a monthly travel letter. Yikes. I called to cancel, but it was a nightmare. The lesson, as always, is to read the fine print. Always read the fine print. YOU DON’T NEED TO KNOW YOUR CREDIT SCORE. What good comes from knowing this number? Are you suddenly going to stop paying the minimum on your credit card debt? Are you going to stop eating out and start cultivating organic produce? Are you going to stop paying for premium gas and keep your tires inflated? No, knowing this number changes nothing. @19 Whether people need to know it or not… some people happen to want to know it for a variety of reasons. My father never knew his and was curious. There will be no action taken because of his newfound knowledge– he is just a little bit happier now that he knows. Also, the pirate commercial thing is knew to me. “Free Credit Report” is actually an option that you can include on your personalized ([email protected]) internet homepage alongwith news tabs, weather reports for different cities, etc. which is how we came across it. I am not sure how they snagged that deal–but I have a feeling many people are finding them through that as well. J.D.– thanks for your comment (#18)— and thanks for this article. I’m going to send it to my dad for future use. I’ll agree to always read the fine print. This is a buyer beware situation. We can argue about how to make them legally disclose what they are about, but scams will always be out there and it ultimately comes down to being aware of what you’re doing and really signing up for. Didn’t it strike you that it was asking for your credit card information? Any time you are signing up for a free service and they ask you for your credit card number chances are that they want it to CHARGE YOU FOR SOMETHING. If I call you will you give me your social security number and other important information because I asked? And if you do get sucked in it is now a lesson in being diligent with your accounts. Know what charges should and shouldn’t be there. When we got married my husband had a couple of these things from his credit card (the insurance and credit monitoring they call and push). He didn’t even know they were there. I’m glad to hear your upet about the web sign up / phone cancellation. I absolutely hate companies that take advantage of the opt-out scheme by making it difficult to opt-out. I got burned by stamps.com for this. Funny though, I recently got an e-mail about a class action against stamps.com for this very thing–The waits to cancel on the phone were prohibitively long. So keep up the good work–it’s bloggers and others who keep these companies in line. It’s never a moral issue, just a bottom line issue–Let’s educate ourselves and make it less profitable to pull this kind of crap! JD, thanks for making people aware of this. I know I myself got confused about it, and almost made a mistake when trying to research me credit report. I also think it is important for people to understand that your credit score is NOT given to you for free, because it is not required by the government. I personally think this is a bad oversight on the part of the federal government when enacting this legislation, because credit scores are just as important as credit reports. If you want a free credit *score* (not report), http://www.creditkarma.com/ worked for me. Agreed with #23. I get the impression that many potential creditors only look at the score, not the entire report because they don’t have time for the latter, their system is automated, or what have you. If I for instance apply for a credit card online, the approval process is automated. That means they have to look at my score to give me a decision that quickly. If the score falls too low, then they will look at my report to send me a letter telling me why they rejected me. The score’s a weeding-out tool. By the way, (1) You will not get your FICO score by getting your Equifax or Transunion reports from their websites, only the scores that they calculate. They are two different things. 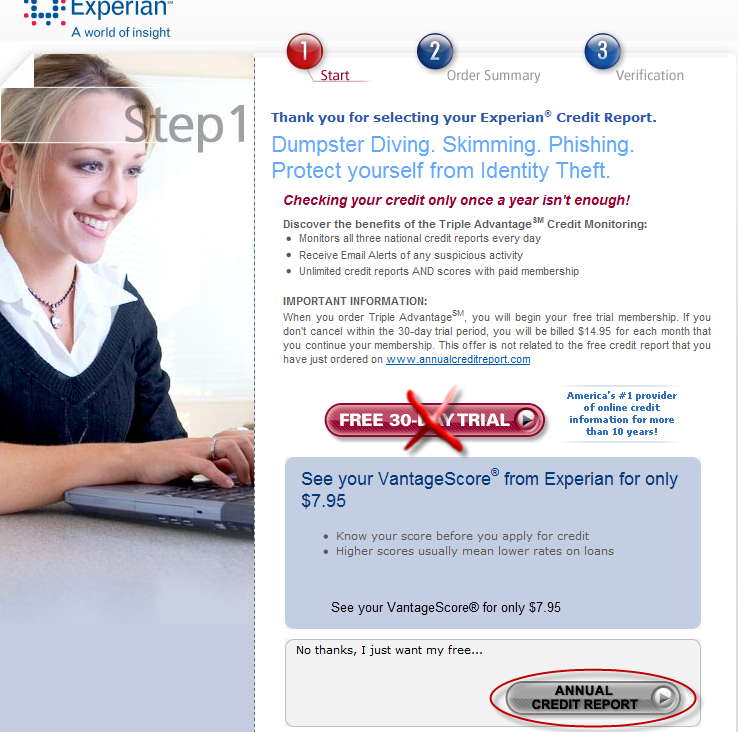 (2) Experian (the FreeCreditReport.com guys) no longer lets FICO sell their score. They only want to sell the score they calculate. I was not happy when I found this out. It’s effective at the end of February, I believe; if you want one last shot at your Experian FICO, better go to MyFico.com now. The other thing: Just because the feds say you have a right to all three reports once a year doesn’t necessarily mean you will get all three. The credit bureaus are allowed to stonewall you if you don’t meet their standards of identification for them to release your report. TransUnion has never, ever, EVER let me have a free copy of their report through the federal government site, and I’ve been asking once a year since this began. On top of that, most times I’ve had someone pull a report on me, it’s been through TU–and I recently pulled my TU report through MyFico and it was rife with inaccuracies, right down to me still being listed under my married name! And the divorce was final in 2001! And they have my student loan on file, which I obtained well after the divorce! I contacted them about corrections they needed to make and now they’re stonewalling me about that too. Apparently they think it’s not their job to correct the reports they generate. I have to do all the legwork instead. Has anyone else had problems with them? Luckily, I don’t need freecreditreport.com to tell me how lousy my credit is right now. There is nothing “free” about freecreditreport.com anyway as we all know. IMO just another scammer in the deep financial industry pool of scammers. Before I type in any web address, I make sure I research that it is safe before I input any sensitive information. I don’t click through links unless it’s from http://www.irs.gov or another government website. That’s the safest way to avoid identity theft. I never sign up for “free” services that ask for credit cards. It’s not worth the hassle. Usually you can find something else that is comparable for free. When you do things like freecreditreport you know there’s a catch. Sometimes a quick credit score and report is pretty convenient instead of waiting on the government to send you one, you just have to watch out for the scams reading is the best way to avoid that. I don’t remember if it was here or at The Simple Dollar, but I was reading about getting my annual credit reports (three, actually – one from each agency) and a smart blogger or reader pointed out that a wise person STAGGERS the reports, so you can check one in January, one in May, and one in September (for example), to get a rolling (and comprehensive) look at your credit picture. What’s the point on paying for credit monitoring when you can do that yourself with the 3 free credit reports? The time and money that you should be investing in if you want identity theft insurance (credit monitoring) should include a restoration service once your identity has been stolen. Credit monitoring is a waste of and does not help get your life back after someone has stolen your indentify. As a notice for people who use Free Credit Report with the intention of cancelling. They put you on hold FOREVER before you get to talk to a real person. I got fed up, found their contact e-mail, and demanded that they cancel my account and send me confirmation of doing so. I got an e-mail back the next day with the confirmation. So if you do use them, send an e-mail to cancel, as you might never get a real person on the phone (and I suspect they will pressure you into a discounted rate too). I signed up for FreeCreditReport.com about two years ago. Like everyone else, I actually thought it was free. Then they started charging me about $12.95/month. After I found out who Triple Advantage was, I kept meaning to call in and cancel but since $12.95 is a pretty negligible amount I never got around to making the call. So I ended up subscribed to Triple Advantage for approximately a year and a half. After calling them back a couple of times, I realized they have a script for keeping you from a supervisor. You ask, and they ALWAYS tell you he’s in a meeting and they don’t know when he’ll be available. Anyways, finally I managed to get them to agree to cancel my account and refund me 2-3 months worth of charges. I told them this wasn’t enough, warned them I would contact the BBB, and then did so. In the end, a couple weeks after contacting the BBB I got a FULL refund of all charges from the past 18 months. It’s a great commercial though….Freeeee Credit Report dot Com…. I’m singing it now! Anyone for Red Lobster? To Dana #25: Yes, I’ve had problems accessing my TransUnion report online. They had my married name wrong. I sent them a letter and copies of ID, and all they did was put my real name down as one of my “aliases”. I’ve been looking into this lately because my sis recently had something go to collections. I want to help her pull her reports and score in a month to check to make sure the account closed and assess the damage. In this case the score is important because there is a significant chance she will want a loan of some type in the near-ish future. A few PF bloggers (I forgot who, I know I got linked there via PF page at AllTop) have tried CreditKarma.com and seem to universally report that it is a good but inaccurate estimate when compared to the actual scores. Creditkarma.com was off by a “tier” for at least one person so it wasn’t a good indication of what sort of loan rates would be offered. … so CreditKarma is estimating my score, rather than reporting it? They didn’t get me with that “free” crdit monitoring, I don’t appreciate abusive business practices so when I noticed that experian no longer allow consumer to see the FICO score based in Experian data but still selling those FICO scores to lenders I decided not to do any more business with hem. I placed a security freeze in my experian report, that means no more revenue for them using my credit data. I still have Equifax and Transunion open, so far I didn’t have a single problem to obtain a new credit card an a new car loan, I guess a mortgage would be a different story but I,m not planning to move anytime soon. It’s ten dollars to freeze it. After that you can unfreeze it for free. I think Experian it’s the only one who charges a fee for a temporal unfreeze but a permanent lift is free in all 3 bureaus. Good post! People need to know. What a bunch of naive people. If you entered your credit card and still thought it was going to be free, you’re an idiot. Plain and simple. That’s a clear indication that you are signing up for something you will be paying for. If people don’t pay attention to what they read then they shouldn’t complain that they were duped. Requesting sensitive financial information from a website you found on Google doesn’t seem like a good idea in general. It would probably be safer to go to one of the credit reporting agencies’ websites and start looking for info on how to get your free annual report there. I use virtual credit card numbers whenever I shop online. I sign in and generate a number for each shopping experience. They are one time use and expire the next month. I don’t know if “free”creditreport.com would except such a number but if you used one to obtain a credit report in the later half of the month, the number would probably expire before FCR attempted to charge it. Does anyone else find it ridiculous that you have to pay to see your FICO score? It’s like paying the dentist for the privilege of seeing my own x-rays. It’s information about me, therefore I believe it should be available to me free of charge. A final thought, many people check all three bureaus at once. I spread mine out and check one bureau every four months. I’m able to catch and fix any wrong or fraudulent information three times a year for free. I found out the hard way. I noticed a charge of $14.95 on a credit card that I rarely use. I called the bank and was able to trace it back to free credit report.com. I had been charged for two months. I gave them a call and asked them what exactly about them is free? The representative ran off some script that was of no interest to me. Why would I want to pull my report every single day? What kind of offer is that? Look, any time you want a updated credit report you can have it for free. This is one of those things credit bureaus have to do under the law but don’t want you to know. I came across of this, I tried and It works. The various CRAs tend to hide the free online access. For example, the Equifax tries to convince you to buy it or that it’s only accessible through mail. All of them require verification of some form, usually a series of questions, and I think TU requires you make an account if you don’t already have one. I signed up for freecreditreport.com several years ago. It has always been clearly stated that you are getting a free trial with billing if you do not cancel. Additionally, within 10 minutes of signing up and finding my information I called them up and told them I wanted to cancel. There was minimal hold time and a single, firm refusal to continue service was all it took. Coming from a long-time System Administrator I will say this: even smart people are dumb when it comes to computers. It is extremely common for people to simply click through windows and dialog boxes as fast as possible, never reading a single word. I’m somewhat surprised that this entry didn’t mention Experian’s “secret” scores. As a consumer, there is no way to find out the score Experian is giving to banks. Also, I think some might be under the impression that credit scores will be on the credit report. It is important to make sure there aren’t errors on your report. But the score is used for many things. Such as mortgage rates. Getting a better interest rate can save thousands over trying to lowball the seller. 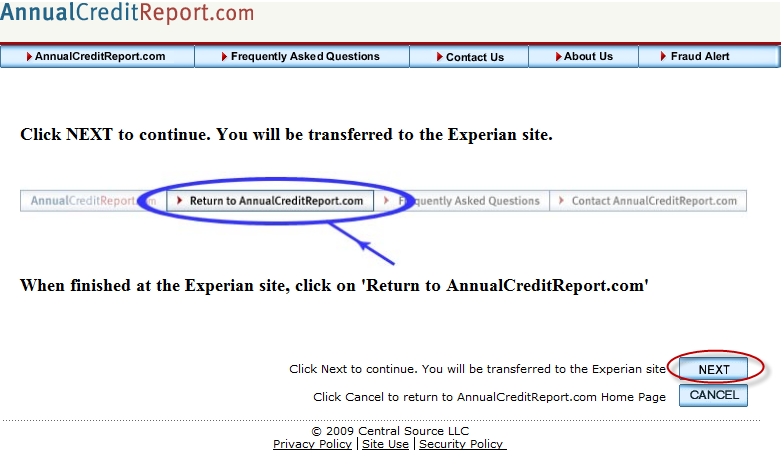 I recently pulled my credit report thru annual and found out that experian routes you to free credit. I thought I was savvy and knew not to agree to the score. I know I did not sign up for Triple advantage, but somehow the 14.95 showed up on my cc. I’ve done FreeCreditReport like 5 times since they first started, just take the trial and then cancel it. What is so hard people? They make it pretty clear on their site that they will charge you after 7 days. Open your eyes people. It says this on their homepage!!! Thanks, this was a great link! It reminded me of a credit issue I have, and gave a nice summary of my current standing despite not giving my *exact* credit score. This is so cool! I got all A+s! Just think where I’d be if I had been this good a student in school! LOL, thanks to JD and all of the financial gurus I’ve been listening to, it would not have been possible without you. And I guess that having a mortgage does pay. In this one small instance. I don’t understand why credit is so bad. I love credit since I have incentives (like prizes) for using it. Even though I’m controlled and just use with things that I would bay anyway. So I just see advantages using it. CreditKarma.com has a similar thing, that I thought was quite cool. Unfortunately, I have 14 inquiries in the last two years, and not enough credit accounts (10) so my credit score has lowered a bit in the last two months (715 – 680). Oooh that’s great. I’m all A+ except my account mix, for a total grade = A. I really appreciate the feedback from them, because it’s telling me there’s pretty much nothing I can do (short of getting a mortgage) to improve my one C grade. Good stuff! The website isn’t accurate at all. I had a bankruptcy in 2005 and it says my credit is A+ It doesn’t mention the bankruptcy at all and says that I have 12,000 in available credit, when I have no credit cards whatsoever. 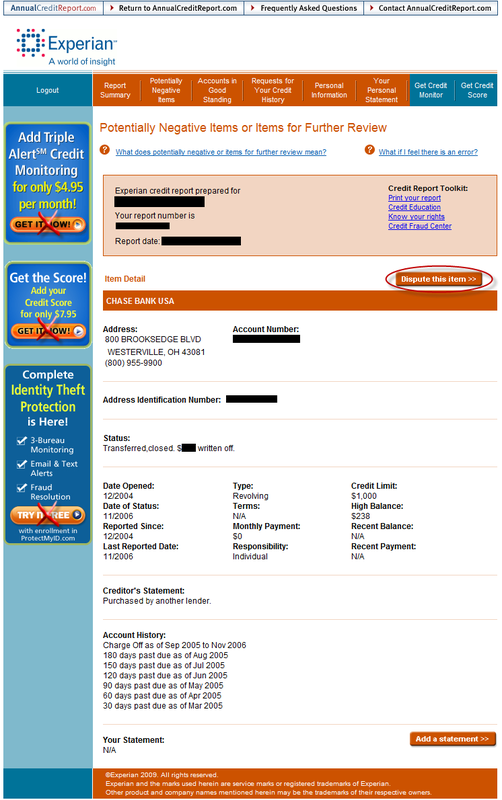 You may want to use annualcreditreport.com to pull your TransUnion report. Because the data in Credit Report Card is based on your TransUnion report, it’s very likely that your TransUnion report contains errors, as well. You’ll want to fix those. It probably wouldn’t hurt to check your other reports, too. This is no different than CreditKarma, pretty old news in my opinion. Thanks for the link! I don’t want a mortgage or an auto loan so I guess my credit score will continue to be below 700. Why isn’t my savings taken into consideration? I’m 23, and after looking at this, I almost feel like I’m being penalized for being responsible! I did not take out any student loans in school, and only have 3 credit accounts on record, plus one car loan. That got me an “F” in the Account Mix – and it’s too late to get a student loan unless I go to grad school! Buying a house isn’t in the cards for a long time, so am I just screwed in this category? I’m also young – my oldest credit record is from 6/2007 – and I feel like they’re counting it against me that I didn’t get a credit card in high school like some of my friends. Shouldn’t age play a factor in these scores? i find tools like this aggravating. i have over $10k in credit card debt right now (approximately $13k at it’s high point), and i’m living paycheck to paycheck for the most part trying to save and pay debt down at the same time. this report gave me all A+’s, but a B- in inquiries and an F in account mix. i understand how the credit scores are calculated and how all the percentages for each category factor into it, but it bugs me that it tells me, “you’ve done a great job of using your credit cards responsibly and avoiding high balances”… No i haven’t!! i was dumb and racked up $10k in debt that i’m now struggling to pay off. yes, my debt-to-limit ratio is 14%, and yes, that is better than a 50% ratio, but it’s still not good! i consider myself a fairly intelligent person, but i can’t wrap my head around why a report like this would give a false sense of encouragement. According to this report, i only need to mix up my debt accounts (most likely remove some of the 20 credit accounts i have), but other than that, i’m in great shape. i beg to differ. The “credit report card” is an interesting concept, but if Credit.com is pulling a credit report on me anyway, I’d like to see the actual report. There’s not much I can do with a bad grade on my report card if I can’t look at the accounts that are dinging my score. Why not also provide the actual credit report? Quizzle.com launched with the report card concept 1 1/2 years ago. It grades you on your overall credit situation, but also gives you a free credit report (and free credit score) so you can make sense of your grade and actually do something to improve it (if your grade wasn’t what you had hoped for), including disputing inaccuracies online. This is great! But unfortunately I’m Canadian and it won’t work for me. Is there anything like this in Canada that you know about? I liked this report much better than Credit Karma, and I discovered that my account mix was poor, which I had not known before. I think this compliments your free credit report well, since you can check it once/30 days. Good free alternative to MyFico, as well. Wes- I am 23 too, and only have *one* credit card, no loans of any sort, ever, so my grade is also low in that area. That and the age of my credit are the only things that hurt me. Makes me wonder if it is better to open another CC (for my business, which would be useful potentially anyways). I plan to buy my next car outright, and when I buy a house to pay it off quickly, so I think I will be stuck with a low grade in the mix category- of courses, the CC companies *want* you to have credit- just not too much, right? It must be noted that, as Dave Ramsey says, “a FICO score is an ‘I love credit’ score”. In other words, FICO scores, this Credit Report Card and the like judge your interaction with credit. It’s by, and for, companies that make money off of consumer debt. So there is a natural bias towards using credit. At the end of the day, it’s not about how much money you have, how much income you earn, or even how much money you have borrowed. It’s about predicting whether or not you will be a profitable customer. For consumers like us, the benefit of knowing this information is that it tells us whether we will get the best interest rates when we apply for new credit. @Wes (10) – yes, age should play a factor, and it does. Because you are young, and have less credit history, you are a greater risk to them. Sorry! I’m up to 13 years of responsible repayments – you’ll get there too. Your credit score is the most overrated number in personal finance. If you already own a home (or are happy wherever you are), and don’t need to borrow money with credit cards, it becomes almost completely irrelevant. Sure, a few employers will check it (most wont). And cell phone companies will make you pay a deposit if you don’t have one, but it’s not nearly the huge, life-changing thing that the internet would imply. Go ahead, ask me about ruining my credit score and all the things I was unable to do because of it (there are none, except “get credit cards”, which I didn’t want any more, anyway). If you want to worry about numbers, worry about your checking account balance, or your blood pressure. Both are far more important. I got a C which is due to my “F” in payment history. I have a collection with BMG Music that I am in the midst of disputing. Pretty cool tool! As soon as I clear the collection I should have an A or B.
whereas my FICO is 698 (TransUnion – 3 days ago) and my PLUS Score is 738 (Experian – yesterday). My account mix was a C- everything else was A+ but the info was funky enough to make me go to annualcreditreport.com because I was due again anyways. Sure enough Transunion thinks I still have a credit card account open that I don’t. So big deal I am using 1% of my credit card instead of 2% they check it tomorrow and I will be using 0%. @18 Tyler – I agree with you except I am now finding that I get good credit discounts on my insurance policies for houses and car. This is saving me a few hundred a year. What a great tool! Even if it is too optimistic or inaccurate at times, I think it will be especially helpful to those who have a hard time figuring out how to read their credit report. Thanks for the great post. I’m just not in the mood to see a huge outstanding student loan balance. Nooooo thanks, honestly. I have my nice credit cards, I have those loans and when I got my car loan in June I was told the only thing holding me back from qualifying for the best on my own (hubby cosigned was the age of my report. Otherwise, as far as my bank was concerned, I was the perfect loan candidate, which she complimented me on seeing as I’m 21 and was 20 at the time. My report card says ‘B’ due to the fact that I have a young credit history (arrived into US 6 years ago for Grad school). No mortgage reduced my rating in the account mix category. The major killer (F) in my report was in the category of payment history. I have 2 late payments that occured 2 years back. One amongst them was 30 day past due. Since then my payments have been regular (since I stopped using credit cards). But it has not moved beyond the 780 score for me. In the past (2005) I had one store credit card from Kohls, which I never used and also shredded it.But it reflects on my credit report as acount in good standing. If I cancel that account will it make a difference? Since I have heard that store credit cards dinge your score…! I had all A+ except in Account Mix, where I had an F. I don’t have a mortgage or car loan… seems a bit silly to give me an F just because I don’t have debt. They really want me to finance my next car purchase.. haha yeah right. I second Dana (#13’s) comment. I’m Canadian and unfortunately there are no free options for us that don’t involve some sort of scam. @Tyler – as I understand it, most insurance companies pull it as well, so it could affect your premiums. I’ll second (or third) the comment that Credit Karma has been doing this “report card” for at least a couple months now. I got dinged one month due to a higher than normal credit card bill. Since Chase doesn’t report a credit limit it showed up as 100% utilization. Pretty cool – now how to I cancel? I can’t find it. @Chris Brown (#9): I don’t have a mortgage or auto loan, and last time I checked my credit score it was well above 700… also, income and savings have absolutely NOTHING to do w. your credit score. Thanks for posting this link. I’ve avoided looking at anything other than the occasional account list to check for inaccuracies because of the hole I’ve been digging out of. I just didn’t want to see how bad it still was. Today, because of your post, I caved. Glory be! I expected that big red “F”, and when the “B” appeared, I nearly danced around the room. Sweeeeeet progress. Oh no, not TransUnion. I already use CreditKarma and they pull from TU as well, and it is the *worst* of the three bureaus for me. Not only does it feature my lowest FICO score, but when I tried to correct a few items on the report, I got the song and dance that it’s not TU’s job to investigate items that I dispute, that I have to go through the creditor and then hope they tell TU it’s been fixed. Last I checked that was *not* what credit reporting law says… but it’s on me to prove it and put *them* through the wringer. I wish more of these online services would go with Experian or Equifax. I have never had a problem fixing errors with those two. #9: Nobody takes your savings into consideration unless you’re getting a loan from the bank where you hold your accounts. #10: It’s against federal law to discriminate according to age so no, I don’t think credit scores will ever take age into account. You might look into PRBC.com to see if they can be helpful to you building up a credit history. At the moment they seem to be most useful to folks who are trying to get a mortgage, but in the future their report may come into wider use. It will never cost you money to look at your report, although it does cost money to get a verification from your landlord or utility companies. It *is* possible to get a credit card and not run into trouble. The question is can you reserve it for a few small purchases each month and then pay them off immediately. I wish I’d thought about that fourteen years ago; I wouldn’t be in my current mess. Yep, way too optimistic – by 50 to 100 points in the various scoring models. Gave me an A and estimated my PLUS score at 740-830, my actual PLUS score from TransUnion is 701 (late cc payments 4 years ago). Do you have an equivalent to this? I understand the need for credit report cards, but are there practical tools that will allow you to follow up on the parts where you get a bad grade? It’s one thing to be told your a poor steward in certain areas, but without an action plan it is difficult to change. I always thought there was a market for products like this that “simplify” the interpretation of credit reports. I personally don’t have any issues figuring out what is relevant on the reports for my wife and I, but I know my parent’s require a lot of help. Personally, I’ll probably just stick with the annual free reports from each of the three agencies. However, I would feel comfortable recommending this service for those that need some help with a basic game plan for improving their credit scores. I personally did mine and got an A too. YIPPIE!!! There is one important piece i think you forgot to mention. This Credit.com product educates you as to what your score means. I have never been offered as much education material when I get my typical credit report. Best of all, they sort through the dozen or so scoring models that exist and tell you how you would line up in their system too…… NICE ! I just heard that Credit.com won the ‘Best in Show’ at the Finovate Conference in New York today. I found #11’s experience to be informative. Does this thing really work as well as people say? He has done a “bad” job and got A’s! What’s up with that? I love the interface for this. Very easy to understand and very easy to just grab a quick snapshot of how you are doing although it would be nice maybe if they pulled data from more than just TransUnion. For free this is a great tool! 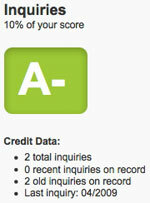 My credit mix is an F, making my overall score a B. I own my home and cars outright. Having 12 paid off student loans and 20 perfect credit accounts means an F because I dont go into debt for cars. I would think the non-auto installment loans mixed with the revolving history would mean much better, with Fs being reserved for those with no mix. #11 makes perfect sense. The debt to limit ratio is low and he pays on time. And frankly Ive paid off more than that in 1 year working not much over minimum wage. So from my perspective it’s not much debt. Of course we all have different ideas of that. Some people are bringing up valid points. Your score goes down if you don’t have a wide mix of credit accounts (ie, car loan, house loan, CC’s). For those people who pay cash outright for large purchases, is there a work-around that will keep their credit score as high as possible? For example, how do the three credit report companies (Experian, TransUnion, Equifax) factor in loan accounts? Is the length of the account a huge factor, or just the fact you had an account? I’m thinking that a person who has the full amount of cash to buy a car could open a loan for a small amount anyway (ie, $6,000) and pay it off in a very small amount of time (say, 3 months, so not much would be lost in interest) just to have that loan on their report? Or would the duration of the account be too short to make a difference? This is a British example: I moved to the UK, and was planning to buy a house there. I had savings, and no debts whatsoever. But no credit rating, because I had just moved to the UK. The friendly lady in the bank mentioned this would create difficulties in getting a good mortgage rate. She recommended taking out a (totally useless) personal loan, and pay it back every month for a year. That would help me to build a good credit rating fast. This shows how ridiculous the system is – if there’s a paper trail, you’re reliable… If you make debts and pay them back, you are considered more reliable than a person without debts. I’m not sure what to make of this. At first look I’m quite enthusiastic about it because I got a score of C, A+,A+,A+,A+ with an overall A. I filed for bankruptcy 2 years ago but have been in good standing with multiple credit cards since then. My debt ratio is also good but I’m not quite sure I buy the fantastic rating they gave me this soon after my bankruptcy (damn divorce!). I pulled my credit score last spring and it was around 600. It cant have possibly gone up that much since then could it? I used to work at a credit bureau building credit scores. A couple of my coworkers were partly responsible for the development of the Vantage Score. All my projects were custom models. There is an inherent assumption these scores make that most people ignore. These scores asses the likelihood you will go bad based off of your past transaction history all else remaining equal. The last part is key. Nothing remains equal. The very fact of applying for more credit, or being granted a new line/loan/mortgage etc changes things. Your risk profile changes. What’s more, these generic scores DO NOT factor savings or income in any way shape or form. The CB’s don’t have that data. Therefore, the responsibility shifts to the lender to understand whether the consumer can afford to service their new debt in conjunction with everything they currently have. To the poster who indicated a large debt amount but low utlization; yes debt amount plays a factor in your score but the utilization plays a larger one. Again since the models don’t factor your ability to service the debt going forward they score you well since you have serviced it in the past. Lenders that require proof of income, lenght of employment, and proof of savings are better positioned to accurately gauge a consumers risk on new debt. But that still assumes a recession doesn’t come along and force them out of their job or an accident or illness otherwise prevents them from working. Loaning money is risky business and even with today’s modern computers and massive databases lenders do not see the whole picture as it stands today and at best are slightly better than random at guessing what the short term future will bring. This thing gave me an F on payment history because I had two late payments in the past 7 years. And it said my credit score is fair (under 700). It’s interesting, I just got a mortgage at 4.75% because my credit is very good (over 720). Those same late payments were on my credit report when I was given a good to very good score by all three reporting agencies. Perhaps the inquiries now on my account dragged the score down, but it doesn’t explain why 2 late payments in 7 years gives me an F.
I just got an FHA mortgage, so maybe it is the new rules, but they wanted to see all my savings, even CDs and 401k balances. And they wanted me to explain any big chunks of money that appeared in any accounts in the past year. They seem to be a lot more concerned now with what your income is, what your savings are, how realistically you can pay. Of course I had another lender (I didn’t go with) telling me I could afford WAY more than I can afford, so some are still up to their old tricks. CreditKarma already does this same thing and I am curious to see if they give the same grades. I am not going to try this site since I already use CreditKarma…but just good to note. I just went to creditkarma and ran what appears to be a very similar report and it was a bit lower and more inline with what I expected. So…overall, I would say this is a tad optimistic. It gave me an F for Account Mix because I don’t have a mortgage or any student loans. Seems kind of harsh. The other categories were all A+ with an A overall. I canceled a bunch of cards to simplify when I converted to paperless budgeting, and my score barely moved. So weird. I’m a current user of Credit Karma and I just tried Credit.com’s version. Both are excellent ways to help people understand his/her credit report. I saw an earlier post of those who were worried about giving away their social which is understandable and then I saw a comment about how to delete your account with them. I emailed their customer service and asked how to go about this and they responded within a couple of hours stating I just had to email them and they would delete it. So I tried it to see how the process went and customer service was incredible. This was all completed within a couple hours. Top notch customer service and A+ to credit.com for making it so speedy. So if you want to at least give it a try and then delete your account, you can feel confident that the account removal process is quick and efficient. Thanks for the post JD! I already keep track of my husband’s credit through TrueCredit (not free, but cheap – plus it notifies me of changes so if something hinky is going on I will find out). Since so many of our accounts are joint, I rarely look at my credit. I found from this site that my credit is an “A”. I scored nothing less than an “A-” on any area (and was an A+ in a couple of areas) – the younger people on here shouldn’t worry about the areas where they aren’t graded so high (mix, for example). It’ll happen in time. Just get a good credit card; pay it off every month, and in time you’ll build a good credit history. And eventually, almost everyone buys a house which will help your credit – just keep doing the right things for NOW. I haven’t used credit in a long time. I have a good credit report score, but I am told it could be better if I borrowed( and paid back on time ). What would be the minimum frequency and size of credit card loans I would need to boost my credit score? This cannot be right. It’s telling me I have an excellent score (just an F for account mix, but without a mortgage or auto loan, that isn’t changing) and I absolutely do not have excellent credit. In fact, it’s around 614. Far different from the “750-850” they say I have. I also use Credit Karma, which provides very similar info and also does soft inquiries on TransUnion. This was an excellent article… I’ve been looking for something that is a little more robust than CreditKarma, since it only provides one score (although unlike Credit.com it provides an exact number). As for worrying about social, since the site is https: (secure) your social is encrypted and not really an issue I don’t think. I just did it – I have a credit score higher than 167 million other people!!!! The only disappointment was an A- in Credit Mix. How can I improve that, especially if they don’t want me applying for more credit or higher limits? I checked my credit yesterday and realized that I need to decide between paying off my debt one at a time or improving my overall credit score by lowering all my debt. People will just keep applying for new cards to get 10% off that day’s purchase or a free gift. Credit they don’t even need. It’s nuts. That’s pretty neat! I got A+’s in the first three categories, C- in account mix (no student loan or car debts), and A- in inquiries (refinanced 1.5 years ago and considered re-refinancing and must have had some inquiries in there). I take the “I love credit” score with a grain of salt, but it’s nice to see what’s going on. So I assume this won’t work for me, but I’d like to be pleasantly surprised. Yes, the classist credit scoring system considers your credit mix poor if you don’t have a car loan and ESPECIALLY if you don’t have a mortgage. The mortgage is the biggie, the holy grail of credit mix. I have NEVER seen that addressed online or in print, but I think it would make an interesting blog post. Nice instructional post! I remember getting scammed on that freecreditreport.com site a couple years ago. (They sign you up for some credit monitoring service). Plus I hate their commercials! Thanks for showing us the right way to check your credit report. Thank you so much for writing this! This is a huge help. I’m 24-years-old, and now I will finally check my credit report for the first time. 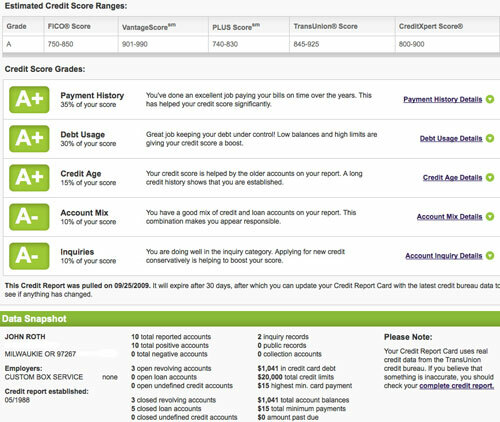 The screenshots are a little blurred, so I apologize if I’m asking something that’s supposed to be visible: Do you see your actual numerical credit score on the Report Summary screen? I have a question, but this website is so not setup to ask them a question. I just changed my name. Like. A couple weeks ago. (Got hitched.) Not all of my accounts have made the switch, but most have. Is this thing going to freak out when I put my soc. number with my new name? Note that AnnualCreditReport checks to see if you’re located in the US first, and won’t let you access your credit report otherwise. Quite a hassle for financially-minded Americans living abroad. @Stephanie: No, you won’t get your actual credit score, just a report where you can validate information and report inconsistencies. CreditKarma.com will show you your score for free. Also has a score simulator which allows you to see if things like adding a new card, or closing old accounts will do to your score. I’ve been using it for months and have not been charged a dime. I’m just concerned how accurate it is – since I’ve seen my score change negatively when I’ve only made positive changes. But it’s good to see. They won’t ask you for ant credit card info when signing up. If anyone else has had any experience using CreditKarma.com, please let me know. I’m relatively new to keeping up on my report. I stagger my 3 free lunches too. It’s worth noting that an error can exist on one report and not the other – it happened to me. On Experian only I was the proud owner of a $294,000 mortgage from 5/3rd (what kind of a stupid bank name is that anyway?) but did not actually own the house accompanying the mortgage! I made a few calls and had it removed, it was pretty simple really. Apparently there was a guy with a very similar name and SSN#. Anyway, take Baker’s advice here – only use that free site and go get your report(s). @Stephanie – As Bob accurately pointed out, you will not receive your numeric score, but rather just the report. Good to hear you are going to look it over, though! @Bob – I only know of the 30-day trials. Like you, I’m extremely weary of any of those options. I’ve heard decent things about MyFico.com’s trial, but am not familiar with it enough to recommend it. @Matt – You make a great point! Usually this Identity Theft issue only shows up on one of the reports. The others do a better job of keeping it from being put back on. You don’t get to see your actual “credit score” by viewing the free report. You only get to see all the elements that go into making up the score. In order to your numerical credit score, you have to sign up for the 30-day trial. If you decide to do this, know that you will get to see your credit score…for free…but getting these kinds of sites to cancel your free trial can be a real hassle. If you’re not firm and consistent with them until they cancel it, you’ll likely end up paying for a service you never actually wanted. I love annualcreditreport.com! I recommend it to all my clients. Great explanation here, Baker! You can get your credit score for free on Creditkarma.com. I’ve used it for a few months and it’s pretty accurate. My score was within a few points of when we got a real credit score pulled by our mortgage lender when we bought a new home in July. I’ve used creditkarma.com to get a free score in the past after reading good reviews about the site, but I believe they only report from one agency. Better than nothing, I suppose. If you’re strong willed, a free 30 day trial is probably the easiest way to get all 3 scores. great post and explanation, thanks. As a former credit card company employee, I’d second the recommendation to keep track of your credit history. Errors are made on a regular basis, they can hurt your credit scores – but they are usually easy to fix if you notify the credit reporting agency and the creditor that is reporting the incorrect information. Even seemingly minor details – like the fact that an account was closed at YOUR request, vs. the creditor’s request, can make a difference. And making sure that accounts that you closed are reflected as closed can help your scores. My husband and I were both able to raise our credit scores significantly before we applied for a mortgage just by making some “minor” corrections to our credit histories. Is there a Canadian equivalent to this site? Thanks Baker, Creditkarma.com does give you a free credit score but it’s only from Transunion. The good news is you can get it as often as you like even though it’s only updated once a month AND it’s a soft pull. Thank you! I’m 26 and have been terrified of money my entire life (terrified in the sense that I earn it and then put it in a savings account and go, “Don’t do ANYTHING. Just stay where I can see you.” *watches it nervously, to make sure it doesn’t go getting me in debt somehow*), and have just started trying to learn about personal finances so I can get over that—paying close attention to the terms of the accounts I hold, learning about my 403(b), checking my credit reports, etc. Any service like this that makes it easier to gain access to the information I need is much appreciated! I’ll use this to check out my credit report this weekend. Thanks for the walk-through, it was very helpful. However, then I went to creditkarma.com to see my actual numerical score – got that – but there’s no explanation of whether it’s good or bad. Where do I find that? I’ve never understood how this “industry” gets away with having such influence over Americans and keeps so much information concealed. Don’t want to get political here, but this is one of the few spaces that I would really like to see the government add more rules and regulations, and during the entire financial fallout no one even breathed a word about it. Sorry to get on a soapbox but I really find the whole credit score system to be rather obscene and Orwellian. Anyone else with me here or am I missing something? I know this makes me an outlier amongst those on GRS, but for years I obtained my free reports, staggered every 4 months, but it’s so much of a hassle (and sometimes you get bounced even when you answer the questions right – part of a marketing strategy of course) that I now gladly pay for USAA’s credit monitoring service and can access reports and scores anytime without hassles. Yes, it costs me money, but it also saves me much time and hassle. To each their own, right? I tried the one from Experian and it was around $20 to see my report 3 times and $20 per month to monitor changes in credit score. I recently changed to Bank of America’s Privacy Assist and for $20/month it gives me all 3 credit scores and reports and emails me whenever there is any change. It is the cheapest one that does everything I have found so far. They were a bit of a pain to start though – I had to fax them proof I was me. I can. It’s easy. My life now, five years after I stopped caring about my ruined credit score, is better than it’s ever been. Keep in mind that it takes *seven* years for items to fall off your credit report, so I’ve been doing just fine with all my late payments and accounts sent to collections and whatever else still on there. It’s in the credit industry’s best interest to convince you your credit report is important — it makes it more likely they’ll get paid. But really, it doesn’t matter nearly as much as everyone says. I have a friend who’s 31 years old and has never had a credit score. He’s never borrowed money for anything. He buys cars cash and has been saving to buy a house in cash when he decides he wants one. I think he’s got about enough saved up by now, too. I don’t know exactly how much, but he’s got six figures in savings and investments. He’s never needed a credit score in his life and he’s better off financially than pretty much everyone, and he’s only 31. Nice guide, a lot of help guides give the basics but really those are still too tough for a newbie. Thanks for the guide, will help when the times comes. I stopped caring as well, but for a different reason. It was high enough. I pay my balance in full every month, never had a missed payment and had a credit card since 18. Never closed one either. The only time I cared was when fishing for a mortgage. I checked, it turned out all accurate and then I found a free “score estimator” that said I was in the 780-800 range so I just went ahead with the mortgage work. Don’t Carry a balance on a card and the score/report only matters at key moments and can be fixed before hand. I’d like to know the process for disputing multiple errors on credit reports. I looked at my credit report recently and found that a lot of information on it belonged to a girl who has my same first and last name that I used to attend classes with in college–and who lives in the same county as I do! Her information includes bank accounts, a mortgage(! ), SSN, telephone numbers, addresses, and other info that is definitely not mine–but is all mixed in with my own info. How do I begin sorting this out? What is the best, least time-consuming way for me to I prove to the credit companies that I am me and not her? @Tyler – the only problem with your approach is events like car insurance, job interviews, renting an apartment, even getting a cell phone, etc usually pull a credit report/score. Baker, this is a very important post. A few months back I checked my credit for the first time, and while I am happy to report I am in excellent standing, the report wasn’t without its errors. Apparently there was some random credit card that I have had for 3 years that I knew nothing about. Ensuring that everything on your credit report is accurate is really easy to do and could potentially save you a lot of headache further down the road. Thanks for posting such a useful guide! @ Christina- I know that consumer credit counselors can help with credit report issues. I believe they provide a service where they pull your report and help you with inaccuracies and any disputes you may have. There is a small fee for the service but well worth it to have someone help you with the headache. If you really want to know your ACTUAL credit score without paying any money, go to your local credit union and apply for a car loan. They’ll do a hard pull, so it will ding your score by a couple points, but hey, i never actually said it wouldn’t cost you anything. I then asked the employee to tell me my score and they did. The only score that matters (or the one referred to as THE credit score) comes from FICO. As far as i can tell, creditkarma uses their own formula, so it’s only an estimate. Nowhere on the site does it explain how it arrives at your score. Great post. I don’t think most people realize that there is a 100% free way to get your credit report without having to signup for some other bogus offer. Nicely done! I’ve got car insurance, a good job, rent a house, and have no problem whatsoever getting cell phone service. You say this is “the only problem” — what problem is that exactly? I have all those things. @threeoutside – FICO scores range from 300-850; anything above 700 is considered good enough to help you obtain better terms. Although a score below 700 won’t automatically disqualify your application, you may not be able to obtain the best rates, and scores below 660 may prevent you from qualifying for certain credit. VantageScore’s range is from 501-990. A score above 700 is considered good enough that a consumer shouldn’t be denied credit solely based on the score. A score below 700 may prevent you from obtaining credit in certain cases. I checked my free annual credit report, but only one of the agencies could actually verify my existence, the other two said they couldn’t find me. I am 27, I have student loans, a number of credit cards (one from 2002), a savings and checking account, a car loan, etc.. How could I not exist to two of the three agencies? I was out of the country for a couple of years, but have been back for a while and am established here now. Creditkarma has had no problem finding me. When I applied for another credit card recently, I was refused, the reason being that they couldn’t find enough information about me, so they had to reject me? Any idea how I can establish my identity with all three credit agencies? Also, how long does it take for an immigrant (with a good job!) to the US to establish decent credit to get a decent mortgage on a house? Great post, I’ve been staggering when I check my reports every four months for just over a year now. The only problem that I encountered was that one Reporting Bureau (I think Experian?) wouldn’t let me check my report online so they mailed it to me instead. Other than that I have not had a problem. Just wondering, if you never need to take on debt, do people ever need to know their credit score? I guess it’s good to know if you’ve been delinquent, but otherwise you don’t really need to find out. The system is pretty good where everybody’s credit scores are reasonable if they are responsible creditors. Great reminder as this is coming due for me! I looked at my credit report for the first time on October 31 last year. I looked at all three at the time … now I know to stagger them! Thanks for the information, the search for errors has begun! I have A+’s in everything except “Account Mix.” I have an “F” in that category! Why should I have to have loans? I thought loans were bad! I’m 22; isn’t it better that I don’t have any loans?! I signed up for a credit-monitoring service after the disputes to see if anything changed. Nothing changed for 6 months or so. I quit the service. I also haven’t pulled my report since this disheartening experience, because if I can’t change something as seemingly straightforward as an account still being open, why bother. I might be willing to try it again, but I would like to know how to make the dispute actually get to the correct information. I’m not sure that’s true. At one point when I canceled a credit card they said that they would continue to process charges to my account if I had already agreed to them (or something along those lines). In this instance my thinking is that if you agreed to have your gym bill the credit card, then your credit card closed your account, the card would still make the payments since you had initiated this process while the account was still open. Have you tried to use the card for any other purchases? Yes, I have used the card for other purchases. I also switched my gym membership to that credit card after the credit bureau debacle so I would start getting regular monthly statements again. Either way, my credit card company says it’s open. And there is no reason for them to have closed it as it has been in regular use even before my gym membership was put on it. I didn’t see the requirement that you had to cancel your subscription in order not to be charged fees for seeing your report. I was charge on two different cards. I notified my card companies and they revoked the charges. To make sure they did not charge me again I had my cc numbers changed. Later the Credit Report. com sent me a notice that my card numbers had been changed, perhaps to try to charge me again? So beware, nothing is free! Thanks a lot for your guidance. I followed you step by step and got it all working perfect. BTW: Thanks for letting us know what NOT to click on while on that site. Are there any comparable websites for the Canadian readers? CreditKarma.com is actually a pretty good service that is free, unlike so many of the other credit report/monitoring ads you see on T.V. They will give you alerts if you have suspicious activity on your listed lines of credit or if anything looks like possible identity theft. I think we all know by now that annualcreditreport.com is th best place to grab a report each year without any strings attached. Thanks a lot for guiding so nicely and easily. the step by step instruction is easy to understand. Would definitely like to thanks to all and congratulate to the writer to post such a nice stuff.